The story of the avant-garde is never just one story. But it tends to get told that way, and we tend to think we know how modernist and post-modern literature and music have taken shape: through a series of great men who thwarted convention and remade language and sound in ways their predecessors never dreamed. Arthur Rimbaud, Claude Debussy, Ezra Pound, T.S. Eliot, Arnold Schoenberg, John Cage… We could make many such lists, and we do, all the time, occasionally including the names of a few women—Yoko Ono, for example, Gertrude Stein, Virginia Woolf…. But we might write it differently, indeed, for the simple reason that women have shaped the avant-garde just as much as men have, as prominent poets and composers, not simply spouses of famous men or guest stars in a mostly male revue. You can hear one version of such a story here, thanks to Ubuweb, “the learned and varietous online repository” of “all things avant-garde.” Their podcast Avant-Garde All the Time offers us two episodes called “The Women of the Avant-Garde,” hosted by poet Kenneth Goldsmith, who admits the survey is a corrective for the podcast’s own blind spots. Through a small but select number of poets and musicians, Goldsmith aims “to show that there are dozens and dozens of great women artists on Ubuweb”—and everywhere else art lives. It’s a moment that saw a revival in the 90s, when riot grrrl arose to challenge the patriarchal establishment. Around this time, artists working in a more academic context directly and indirectly engaged with literary history ancient and modern. Scholar and poet Anne Carson has twisted and translated the texts of Ovid, Aeschylus, Sophocles, and the writers (and translators) of the King James Bible. And German-Norwegian-French experimental poet Caroline Bergvall, whom Goldsmith discusses in episode one above, rewrote Chaucer and rearranged Dante. Both of the links are for part 1. 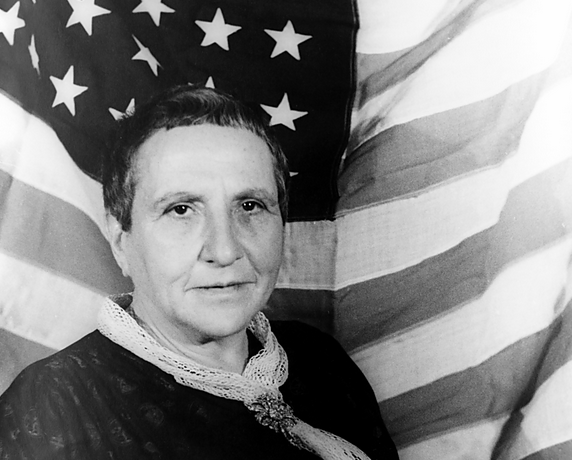 I really enjoyed part 1, but I would love to hear the Gertrude Stein section in part 2.